At The Redfearn Law Firm, we believe in giving back to the community. For more than two decades, The Redfearn Law Firm has generously sponsored and supported many civic, youth and sports activities throughout the community. The Redfearn Law Firm has sponsored many softball teams and tournaments; including the Little League Royals; the Boy Scouts of America; Girl Scouts of America; Mat Club; and Pop Warner Football and Cheerleading. On numerous occasions, the Firm has sponsored former clients for various mission trips and study abroad programs. Paul Redfearn has served on L.E.A.P. 's Board as Treasurer since its inception. The Foundation for Lawyers Encouraging Academic Performance (L.E.A.P.) is a not-for-profit foundation established in 1994 to provide needy children in the community with mentoring services and to financially support educational programs. L.E.A.P. has raised over one- million dollars, and the Foundation's primary recipient for the past several years has been Operation Breakthrough, located at 3039 Troost, Kansas City, Missouri. Founded in 1971, Operation Breakthrough's mission is to help children who are living in poverty develop to their fullest potential by providing them a safe, loving and educational environment. Operation Breakthrough also strives to support and empower the children's families through advocacy, referral services, and emergency aid. http://www.operationbreakthrough.org/ . 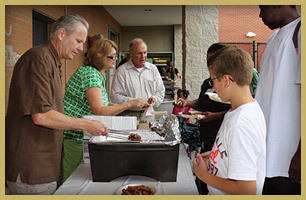 Paul Redfearn, left in the above photograph, is helping serve breakfast at Operation Breakthrough for L.E.A.P. 's Annual Back-2-School event. L.E.A.P. not only provides the Chris Cakes breakfast but as a result of its school supply drive, backpacks filled with grade appropriate school supplies are handed out to the children at Operation Breakthrough. The Redfearn Law Firm has also helped sponsor and contribute to many fund raising efforts for Diabetes research; Breast Cancer research; the American Heart Association; Muscular Dystrophy Association; The Leukemia & Lymphoma Society; Cystic Fibrosis Foundation, and SIDS Resources.